Serving busy families is our childcare speciality. Call us today to learn of our on-call nanny and sitter services. We're here to help! Need a date night sitter? Call us today to get 3 FREE hours for your next night on the town. 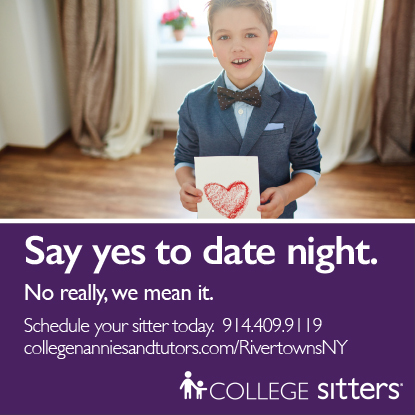 "College Nannies, Sitters + Tutors of the Rivertowns is a reliable childcare solution for my family. I use CNS+T for my weekend sitting needs, as well as through the Bright Horizons Back-Up Care benefit offered by my employer. Even in situations when I need last-minute care, they go out of their way to quickly accommodate me. My kids always enjoy the sitters who care for them too—they’re prompt, friendly and well-prepared!" College Nannies, Sitters + Tutors has been Building Stronger Families® in Rivertowns, NY and surrounding communities since 2017. Locally owned and operated, we are part of your community and here to serve your family.